One of the many "Gods of Buddhism" pictured here is loving Maitreya, known as The Future Buddha. BUDDHISM BELIEFS: Let us turn 360 degrees to our brothers and sisters of the Dharma for spherical strategies. Dharma means teachings of the Buddha. There is a misconception that there are many Gods of Buddhism. Yes, there is Manjushri, Vajrasattva, and Tara—to name a few. These “Gods” are abstract, omniscient mind qualities of our true nature, inherently perfect as God is perfect. 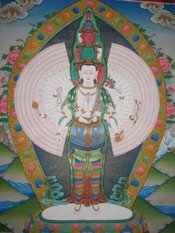 Avalokiteshvara, for example, is the God of Compassion. Tibetans believe that His Holiness the Dalai Lama is a physical emanation of this Godlike essence. For more compassion we do meditation practices, prayers and mantras of Avalokiteshvara to ‘perfect’ this. The Dalai Lama leads by example devoting his life to being compassionate. Similarly, to cultivate skillful means through wisdom, we focus on Manjushri. In Tibetan Buddhist iconographical art (Thangkas) we see various Gods of the Buddhist tradition depicted. Each Buddha reflects a magical display of knowledge. Buddhists have a practice, like lawyers and doctors have a practice. Analogous to a pediatric physician, Buddhists “specialize” their enlightenment activities. When practicing on a particular aspect (law of attraction draws), we raise our vibratory frequency spiraling higher to optimal living. The Rev. Nancy Ash, E-RYT, DD, PhD is an ADL Ministerial Trainer, Doctoral Professor and longtime student of Dzogchen of Tibetan Buddhism. She writes from New Mexico. Thank you for visiting 360 today.